Canicross is becoming increasingly popular. What on earth is canicross you may ask? It is essentially running with your dog – many of you will already be doing this! To be slightly more specific, it is cross-country running attached to your dog. Most commonly the dog is attached to the runner by a harness, line and waist belt but there is nothing stopping you starting off with a collar and lead, gently jogging with your dog and building up to it from there. 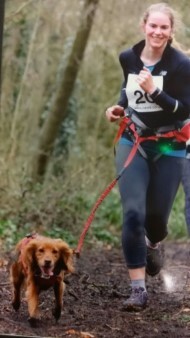 I’ve always enjoyed running (crazy, I know) and started running with my dog Genghis as a way to exercise him and myself. It all just fell into place from there. We have taken part in a few competitions and were recently part of the winning team for the Telford T50 Relay in March. Of course you don’t have to compete, you can do it just for fun. There are many benefits to exercise; your pets’ physical health, your physical health, but also your mental health (and not forgetting your pets’ mental wellbeing). It has helped us develop an amazing bond; Genghis is the most awesome dog I know. I know every owner will say that about their pet (and you are all correct!) I really enjoy going out for a run with him, it keeps us both fit and is a very effective way of tiring out a manic cocker spaniel. www.poochto5k.com/training-programs gives a training plan for a ‘Pooch to 5k’ – where you and your dog can get fit together. There is also a Pooch to 5k group at Attingham Park. Anyone can do it – dog or human. I’m not proud to admit it, but I’ve been beaten by a jack russell and a three legged lurcher when running! You do need to gradually build up your running distance though to protect both you and your dog. If you try too much too soon, soft tissue injuries, muscle strains and sprains are a possibility. Dogs must be over 12 months old before they start running and older still if a particularly large breed. This is to prevent their bones and joints being damaged whilst they are still developing. This is not just a vet stipulation – canicross races will not allow dogs younger than 12 months to compete for the same reason. Similarly it's best to stick to off-road terrain as the hard roads and pavements can cause wear and tear on our joints and will do the same to your pet. Plus, all dogs love a muddy run don’t they?! I also take it easy or stop completely in the summer months when the weather gets too hot – heat stroke is a big concern in these cases and can be fatal. You don’t even need a dog to get started with canicross…. kind of! Shropshire Canicross run regular sessions at Hillbrae Rescue Kennels where the rescue dogs are taken out for a run on the weekend. This has been found to help improve the chances of adoption for many of the dogs there. You can find Shropshire Canicross and many other canicross groups on Facebook, they will often share upcoming events, organise social runs and beginner classes so people and pets of all abilities can get involved. It’s also worth noting that a lot of park runs will also allow canicross competitors; they understandably ask that dogs be kept under control and not interfere with other runners. Again, these events are suitable for people of all ages and abilities. So why not dust off those running shoes and see what you and your friend can do!